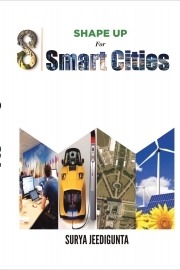 Description of "SHAPE UP For SMART CITIES"
Are you future ready? The world we see now is very different from that of 25 years ago. Who would have thought by click of a button a taxi will stand in front of your house. Who would have imagined through YouTube each one of us has the power to travel the world with a single click. And the pace of change is accelerating the world in the next five to ten years. Shape up to Smart cities is the blue print of what is coming. Why some countries are better prepared than others, why some cities set the pace of innovation and how people can better prepare from what is coming than just be passive observer for a rude shock. I wrote this book precisely to answer the above questions. This is the first comprehensive book on Smart cities. Electric vehicles, Smart meters and Smart buildings are coming in the way of doing our business. It is time to get ready for these big changes and not left behind. All these concepts are explained in simple terms with no high technical jargon. These powerful concepts strongly connect to smart city initiatives. India, China, US, EU and many other countries are investing lots of resources and money in building the smart cities. It is time for all of us to be part of this discussion. Be Smart in Smart Cities. Best known for his Renewable Energy and Smart cities expertise, he founded start-ups SNJ SOLAR and 3P Foundation to advocate and realize both the above causes in a big way. His motto is: Think Big, take risks, make decisions and prove them right. Reviews of "SHAPE UP For SMART CITIES"